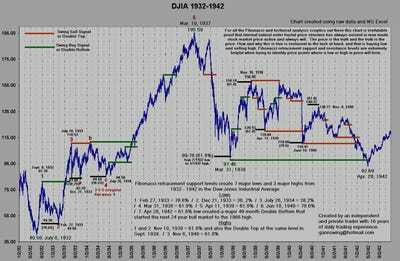 Is History About To Repeat For The Third Time, And Send The Dow Down To 8731? A reader who’s fond of technical analysis and Fibonacci levels sends us in the following chart, that’s certainly food for thought. Marc Faber gave an interview CNBC India today. It is a must read for TBI readers. “The US stock market has now doubled from its low. In other words, there are only three occasions in the last hundred years when the stock market in the US doubled within two years,” he added. One such occasion was in 1934, coming off a “very deeply oversold condition” in 1932 and the other one was in 1937. After 1937 and 1934, the 12 months return were both negative, Faber said. What is so very interesting is that I have been using 1932 – 1942 as an analogue for the current stock market since the NDX low in November 2008 and the March 2009 lows in INDU and SPX. 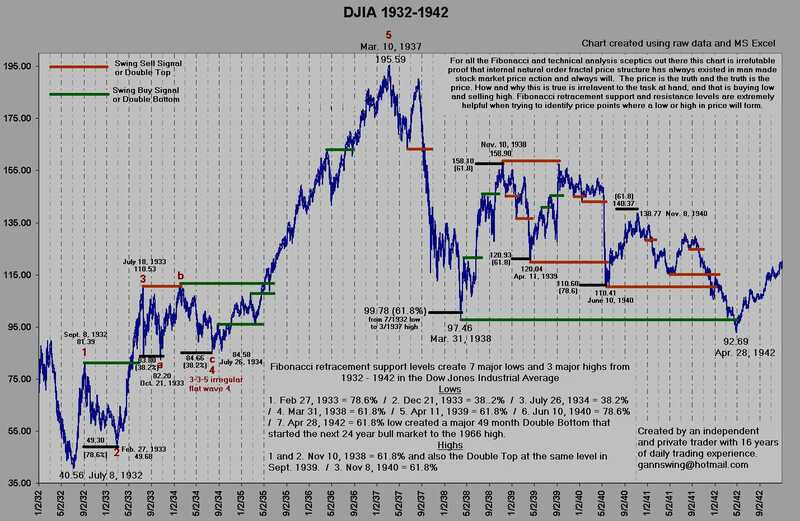 Several years ago I created a chart of INDU from 1932 – 1942 using raw data and Excel and did the Fibonacci maths for the 10 year period. It is just amazing how well Fibonacci levels worked back then. For all the sceptics out there, this chart could change your mind about Fib levels. Is the current stock market destined to repeat the big 61.8% retracement of the current 100% rally since the low? No one knows for sure, but it is worth keeping an eye on this analogue for a little while longer.